Thanks to the rocking, I slept quite well last night. First night I’ve not been awakened with a coughing spell. The few times I did wake up & turn on the bridge camera, I noticed that it got almost totally dark outside for a few hours in the night. Since I’m feeling quite human today, I did the hair thing; & left the cabin about 9:45. There were a lot of “privacy please” signs on the cabin doors up & down my hallway; so at least somebody was out ringing in the new year. I went straight up to the Internet Mgr. to ask if he’d grant me more bonus mins. since I had bought 3 more pkgs. It’s the first time I’ve not had to wait in line to see him; & he was actually in a jovial mood this morning. I stopped to ask the cruise consultant about making an “open booking” deposit (just in case I decided to give HAL another chance). I was told that I would have 4 YRS in which to firm up a booking. Fair enough. I made it to the Lido restaurant just as breakfast service was ending. Took a while to find a free table next to an electrical plug (for those of you who are taking note…..there’s a plug on the outside wall on each side of the ship about halfway the length of the restaurant). I set up shop there for a while. It’s grey & drizzly with nothing to see out there today. I was hoping to get some serious work done. I decided to just wait for lunch service to start; & had a cup of hot chocolate while I waited. (FYI, rumor has it that we’re running very short on milk. They’ve stopped offering carafes of hot milk to use in coffee & hot chocolate. They aren’t putting out glasses of milk either. If you want it, you have to ask for it in those little “juice box” type containers. In a little while Lou came in & sat down with her computer. We chatted & worked on our respective blogs. When they opened for lunch, I perused the selections. I started with a cup of green chile & corn chowder (very tasty) & a bowl of Bami Noreng noodles topped with garlic-lime shrimp & bay scallops (that was so good, I had to have 2nds). Then she & I shared a bowl of the special pasta of the day, baked ham & cheese ziti. 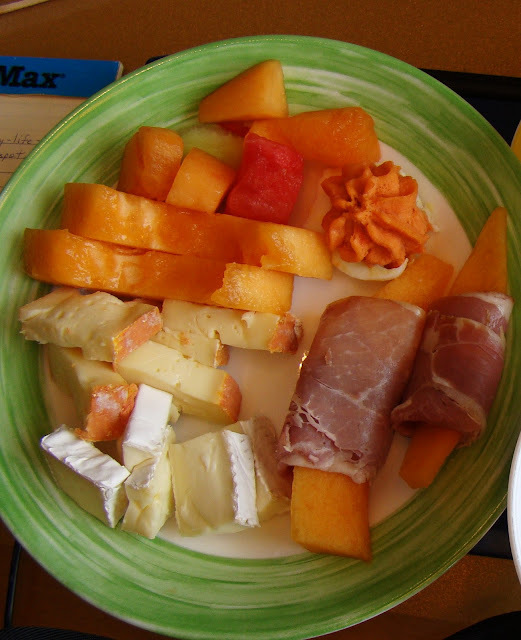 I fixed a plate of prosciutto & melon, brie & muenster cheeses & mixed fruit which I nibbled on the rest of the afternoon. Lou left; & I stayed at the table for a few more hours since I was making some headway getting photos uploaded. Just after the buffet closed at 2, the seas got quite rough. The Capt. announced that we were sailing close to a low pressure system; & that the winds would pick up. Pretty soon you could hear trays & dishes crashing to the floor in the Lido’s galley area. It was difficult to walk; & they blocked off the doors to the outside decks. I went back to my aft cabin about 4:30; & I couldn’t even stand up. So, I got comfy on the sofa & watched the bow bounce up & down on the bridge camera. According to the TV data, winds were over 80 mph. I soon felt a nap coming on, so I moved over to the bed; & was out in minutes. Didn't wake up until 6:30. I went back to the Lido for dinner around 7:15. I was in the line when I spotted Lou, who was about to have her dessert. So, I moved over to her table. As always, we had a lively & entertaining conversation throughout the meal. I chose 2 appetizers; basically because they were both so pretty. One was a tower of crabmeat with avocado salsa, which looked better than it tasted. The other appetizer was prosciutto, cheese & bruschetta. That one was very good. For my entrée I had a piece of calf’s liver with apples & bacon; accompanied by brussel sprouts (I’m going to turn into one), French fries & a mixed salad. The meal was okay; but not photo worthy (even though it is a slow news day). Lou had the chocolate decadence cake (which is gorgeously presented). We both shared the Savarin, which neither one of us were sure what it was. Turns out it’s a cross between a pound cake & sponge cake that’s been soaked with Grand Marnier. It was sitting in a pool of vanilla & chocolate sauce. I think that’s about the best thing I’ve had onboard this ship so far! Lou left about 8:30; since she has an early morning tour planned. I moved over to my “spot” by the window where I proceeded to work for another 4½ hrs. 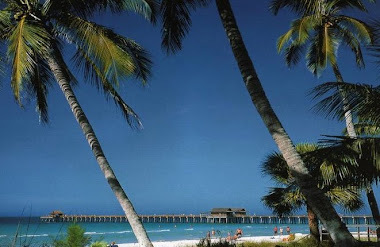 I was able to get the blog caught up, read e-mail, & post on Cruise Critic. My favorite Lido deck steward, Eka, came over to look at penguin & whale pictures & to bring me a cup of hot chocolate. He looks after me very well. During this time various groups of people had come & gone; & the late night buffet had started & ended. I came back home around 1 to find a surprise on my bed. Well, actually 3 surprises! Since my cabin steward didn’t have the opportunity to make towel animals for me the last 2 nights, he presented me with the ones that I had missed. There’s an elephant, a peacock & a frog. Now, usually I don’t want to disturb my towel animals; & I let them sleep on the other side of the bed. This could make things a little crowded tonight. Now, that I’ve had a few mins to think about this, I think I’m going to play a little joke on him. (I’d call him by his name, but I have no idea what it is…..he never introduced himself & I’m uncomfortable staring at their name tags). I’m going to ‘pose’ my animals in the morning before I leave on my tour.